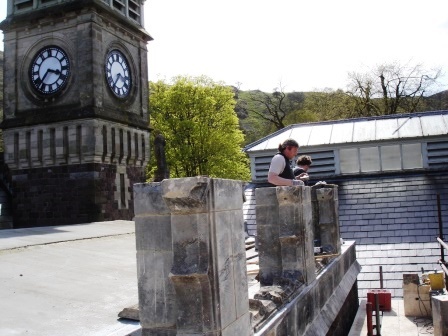 We’ve repaired most of the roof to the main building so the fabric of the building is protected. We no longer need the two troughs and over 100 buckets once scattered around the Castle to catch the rain. There are some areas still needing attention but fundamentally the building is now ‘safe’. 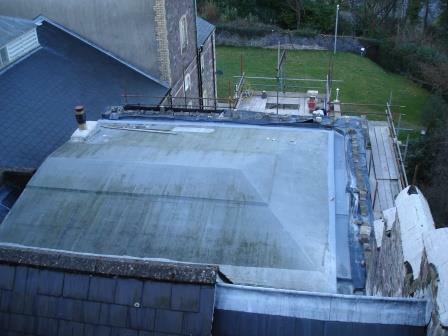 The Lead Gullies & leaks: Previous owners had spent considerable energies repairing and replacing roof slates which had the effect of moving the leaks from slated areas to the gullies and flat roofs. Further work replacing century old lead gullies has taken place. In one five month project the lead gullies between the 160 year old pyramids were replaced. The leaks from the pyramids and anywhere where roofs are joined with gullies in-between were responsible for much of the damage to the main building. Prior to this work being done, one could stand on the second floor of the castle in winter and watch the icicles inside grow longer as water dripped down them, freezing into stalagtites of ice. In the rainy season it would take one man about four hours to empty all the buckets; he would throw the water out of the second floor windows. Another project saw lead gullies between the music room and billiard room roofs replaced, stopping the leaks coming in to these function rooms. I recall early functions where a series of bath tubs and large plastic bins would remain between the music room and billiard room only being removed when the function was about to start. On dry days, in case it rained, we had to be careful not to place any tables under where we knew the drips would land. Water from all the leaking gullies was absorbed into the porous limestone walls internally, causing ceiling and floor joists to get soaking wet, rot and collapse. This would in time destabilise stone walls as the lime in-between gets washed away. So some work repointing has had to be done and you do have to watch out for the odd bulging wall - a preliminary indication the wall is going to fail. A resident was once standing in the theatre garden and watched as an external wall spontaneously collapsed on itself, under its own weight, following a succession of winter frosts freezing the water trapped inside the wall. Another wall that simply collapsed due to water ingress was the main wall alongside the nurses Block. We have not had any internal walls fall down but we have had to rebuild a few arches once we have uncovered them to see what is behind. In the process many of these arches are now exposed - see the Nicolini room arches here. See also the two arches behind reception, which we uncovered when we took out an old hospital lift. These were for two doors which once used to lead down to the cellars. Here, in 1876-78, the two Morgan Morgan families each had their own separate kitchen.